Over the years the La Venta Association has been involved in various explorative expeditions in the most remote areas of the world. On each occasion we have teamed up with companies composed of high level experts. Without their support, their trust in us and in our project, we would have never been able to achieve such extraordinary results, acknowledged internationally both on a scientific and educational level. We would like to thank all of them and all the new companies that will support us in the future. Since 1870 Ferrino has been working side-by-side with hikers, sportspeople, scientists and researchers, inspired by a unique passion: investing in research, technology and innovation to produce high-quality safe and comfortable products, in full respect of nature. Scurion is a Swiss brand leader in the field of individual led light equipment. The Scurion light systems are used wherever quality and reliability are needed. The sophisticated electronics and the high quality of the materials are in fact fundamental features in particular professional activities such as rescue teams, mines, video and photo shooting as well as extreme and outdoor sports. Raumer s.r.l. was established in 1992 by the owner Mr. Cesare Raumer. 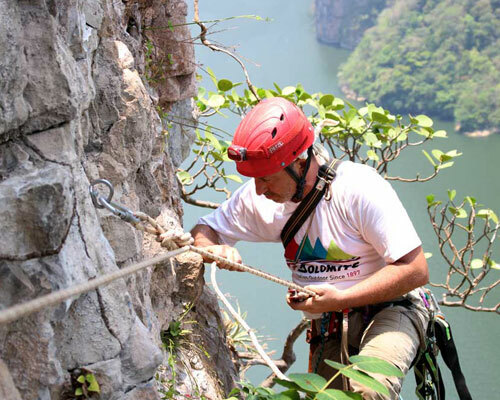 His great love for Nature and for the Mountains, his “deep” passion for Caving ( that he’s been practicing for more than 34 years ), together with a very good knowledge of mechanical technology, have urged him to try this exciting activity. Initially the offer was based on a few items, mainly simple anchorages for Mountaneering and Caving. Nowadays a lot of anchor-makers, throughout the world, choose our products simply because they mean quality, reliability and security. Our entire production is made within our factory and we strictly control the different stages of the various manufacturing processes. With extreme accuracy we check the range and the origin of the raw materials we have from serious, reliable and certified suppliers. Chelab is a lab leader in Italy in the field of testing and a major player in Europe. DEWALT. For over 80 years the brand DEWALT is the leader in the design, development and manufacture of industrial and professional power tools. The delicacy, the serenity, the emotions that an herb has the potential to rais are at your fingertips in the Lessini Mountains (Verona, Italy). The main task of the herbalist’s shop and laboratory Erboristeria Sauro is that everybody can fell this power. Based on receipts from the family tradition, we work rough materials to extract hydroalcolic solutions, mother tinctures, capsules, liquors and derivates, without forgetting the respect for the environmental ecology. In this way we obtain products that in their simplicity, not only answer to a wide set of needs but moreover maintains live the traces and the perceptions of their ancient story. Leaders in the satellite and terrestrial communications market for 20 years Intermatica S.p.A. was founded in 1997 as a National Telephone Operator, Manager and Service Provider of the best satellite communication systems and Partners of the main Italian and foreign Carriers. Intermatica is a member of the commissions for the specific interconnection and regulatory specifications of the Ministry of Economic Development - Dept. of Communications, of the NGN - New Generation Network at AGCOM and, since 2007, is part of the ITU - International Communications Union . Today the company has an experience and a know-how synonymous with quality and guarantee to Partners and Customers. The offices, the network of sales points and the proprietary infrastructures are entirely located throughout Italy. The attention to the customer experience and the satisfaction of the needs have always been the added value of Intermatica, a company in constant search for solutions and whose goal is to make the communications available and accessible everywhere and for everyone. Elifriulia operates on the Italian market since 40 years. Founded in 1971 by Luigi Coloatto, a pilot who knew how to dose dream and initiative, it is still managed by family Coloatto, with the typical pride of those who feel they belong to something important. Core Business: sale rotorcraft, especially Robinson Helicopter of which is the concessionaire, and helicopter services such as: Public Passenger Transport, HEMS, Work Plane, Flying school. S.A.E. srl is a leading company in Italy in the repair and sales of power tools, spare parts and professional accessories. Is also authorized service center for all brands of which is the retailer and, through their experience, is able to offer its customers the highest professionalism and expertise in this market. Hennessy is a Canadian leader in the project and construction of special hammocks with innovative design. In addition to accessories, the Hennesssy produces hammocks for extreme environments, tropical, winter, jungle and traditional camping, with patents in the United States, Canada and internationally. GT line A famous Italian company specialising in the production of technical tool cases which are particularly suitable for protecting fragile scientific, video and photo equipment. It provides over 80 models, divided into 19 series so as to meet the most various needs. Electrolux Global leader in the field of household appliances and professional tools. Winner of the European Commission’s Sustainable Energy Award for its environmental care and its constant work in trying to cut the energy consumption of factories, products and services. Amphibious designs bags, backpacks, carriers and accessories for mobile phones, iPads, iPods, VHF radios, PDAs, cameras and more. All the products have the characteristic of being waterproof and watertight in order to preserve the contents from the attack of water, humidity, dust, sand and dirt. Amphibious products, resistant and versatile, find use in all sports, work and leisure activities (outdoor). Rocco Forte Verdura Golf e Spa Resort Sciacca belongs to the “Rocco Forte Hotels”, the largest operator of 5 stars hotels in Europe. All Rocco Forte Hotels are members of The Leading Hotels of the World. Tiberino Specialty Food is a natural continuation of the journey, along 4 generations, of the Tiberino family. The best typical food from Puglia and South of Italy, the pasta to pasta sauces, from bagels with flavored oils to creams from pickled. A line of more than 150 Italian pasta dishes dehydrated and ready to be cooked in a pan without add other ingredients.